However for us, in the end rain stopped play and spoiled our walk because it was coming down in sheets which made the underfoot terrain very slippery! Therefore our walk was abandoned, and instead we decided to take a scenic drive through the UNESCO listed Magma Geo-park which is a unique geological area that covers a huge area of southwest Norway where the rocks are the same type as those found on the surface of the moon. A 'Hole' we needed to go through from a distance! And just before we entered it! While we were on the dramatic hairpin bedecked road that dropped us down with one switch back after another we pulled in at a view point over Jossingfjord and learned about how this was the sight of the first battle of the Second World War in what was at the time, neutral Norwegian waters. Late in the evening of 16th February 1940 the German tanker 'Altmark' was boarded by a party of Marines from the Royal Navy destroyer HMS Cossack. On board the tanker were 299 captured British seamen whose ships had been sunk in the Southern Atlantic Ocean - they were all freed without injury, but during the dramatic rescue 7 German soldiers were killed in action. Today the waters of Jossingfjord stood quiet and still, but it was still a striking setting - especially when we looked further down the road at the 'hole' we would have to pass through as we proceeded on our journey. The downward slope ended in the town of Sireana, but immediately after we'd crossed over the single lane bridge we started to climbing up the other side of the valley regaining the height we'd just lost. Here the squeezes came thick and fast and Route 44 had certainly turned out to be another one that wouldn't be for the faint hearted. But eventually it improved as we left the sharp jagged unforgiving cliffs behind and passed through the town of Sveiga on Flekkefjord, and very soon after that we were back on the much more comfortable E39 where we found a stopping place for lunch. After that our target was the Lindesnes Lighthouse but to get there Mrs Snoopy played a dirty trick on us! We could have continued along the E39 for a while longer and then taken Route 460, but instead she directed us a 'quicker way on one of her short cuts' This completely negated any need for us to visit any of Norway's theme parks because it turned out to be a Roller Coaster that was about 10 miles long, and by the time we got to the end of it John had to just about prise my very white knuckles away from my seat and all my 🍑 clenching would probably mean I wouldn't go to the 🚺 for at least a week!! Anyway, we did eventually manage to arrive safely at Lindesnes Lighthouse which lies at the most Southerly tip of Norway - thus completing our journey from the North to South Capes of the country. 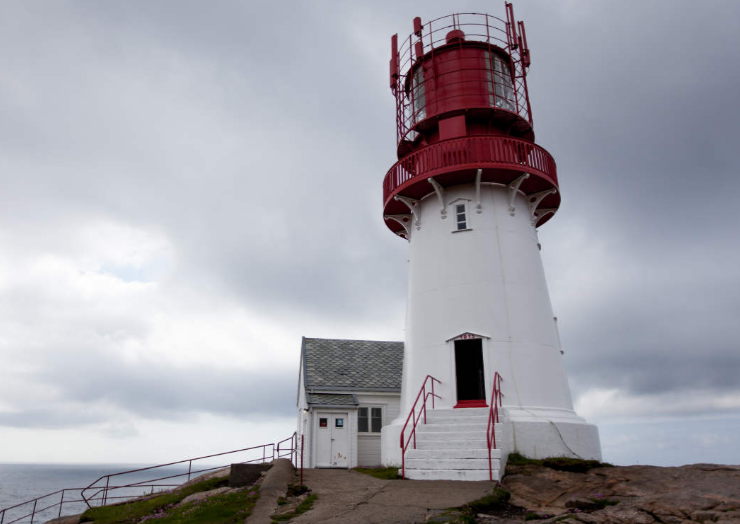 The lighthouse itself was established in 1656, and at that stage it was lit by 30 tallow candles burning atop of a three storey tower, but this didn't provide an adequate solution for the safety of the mariners so it was shut down after only a few months. Then it took many years before coal was fired in an open brazier to make light, and it wasn't until 1822 that the brazier was moved into a closed lighthouse, the remains of which can still be seen. Later still, in 1854 a proper lens of French origin was installed in the brazier bunker and it remained there until 1915 when the the cast iron tower that can be seen today was erected, and then the lens was moved to it's new home. The lighthouse is still in use today, but like many others it is now fully automated. However, the sites interesting foghorn, which is one of the largest of it's kind has now been decommissioned - and we might be quite glad about that cos we're staying here for the night! 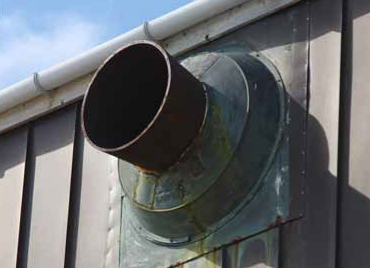 It's called a diaphone and it used 1600 litres of air per second to produce it's almost deafening trumpet blast! These days that noise can only be heard once a year and that's on the last Sunday in July and then anybody in the vicinity is likely to be deafened! 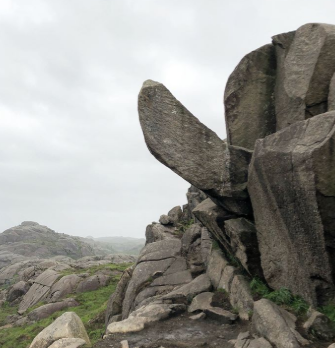 In the area there's loads to explore and that includes several German bunkers and gun emplacements that date back to the Second World War, and additionally, there are numerous paths and areas where you can roam over bald rocks, many of which fall down to the sea. However, they come with a warning about the waves have been known to break over some areas 'SO BEWARE'. But we didn't venture too far because about an hour into our visit the heavy rain returned so at that point we scurried back to T4rdis2 to avoid a soaking. Tonight's home - can you spot us! This morning we left Lindesnes Lighthouse (which incidentally is the oldest one in Norway) in very murky conditions after much rain overnight. And if the forecast was to be believed, it was going to be more of the same for the rest of our penultimate day in Norway. Our ferry over to Denmark is booked for 2.30 tomorrow afternoon and we'll be sailing from Langesund on a four and a half hour crossing to Hirtshals for the bargain price of £115. But that's only because I booked direct with Fjordline after deciphering their Norwegian pages, otherwise other operators wanted at least £185😲! Because of the predicted weather we hadn't really planned to do much today other than cover the 100 miles that would bring us nearer to the ferry port, so as I haven't got much else to write about I'm going to jot down a few thoughts we've got about our time in Norway. I suppose the main ones are - have we enjoyed it and did it live up to our expectations?? The answer to that would probably depend upon which one of us you asked! I've loved the countries magnificence with its wonderful vistas, magical fjords, deep valleys, towering mountains, vast wild wildernesses, and breathtaking waterfalls for at least 80% of the time, BUT occasionally the very long distances we've had to drive each day have caused a bit of cabin fever! And for John, the pressure of having driven a total of 7,700 miles, often on difficult roads has detracted somewhat from his ability to enjoy all of the above! Added to that he's done most of the route planning and identification of places where we've stayed overnight, so while I've been having a 'holiday' he's worked really hard, and now I think he's getting ready to stay put in one place for a few days R&R! Would we do it again?? Definitely NOT - and especially not the jaunt all the way up to Nordkapp! We've been there, done that, but we didn't buy the T-Shirts 😂! We've still got so much more of Europe to explore that we really haven't got time to do it again, and even if we wanted to we probably couldn't afford it! Norway well and truly deserves it's reputation for being one of the most expensive countries in the world and while we've been here we've spent about twice as much as we would have done anywhere else. I suppose to some degree our budget hasn't been strained as much as it could have been because I brought a lot of food with us and we've wild camped for 31 out of the 47 days we've been here. However, that hasn't really off set the cost of tolls (£100 - which would have been much more if our van had been greater than 3.5 tons), Norwegian ferries (£600), or the high cost of fuel, and when you add very expensive food into the mix you soon find you need very deep pockets to be here. However, having said all that we wouldn't have missed if for the world, we've explored Norway from tip to toe and it's very definitely provided a big tick on our bucket list! Today marks the end of one adventure and the beginning of another. We left Norway as planned via the Langesund Hirtshals ferry and enjoyed endured a smooth 4 and a half hour crossing where we managed to read a couple of chapters of our books, play a few games on our tablets, watch a couple of episodes of whatever, and also sat up on the deck for an hour in the warm but windy sunshine. When we disembarked we drove a few hundred metres to check out the Ports dedicated motorhome parking area - but it was horrible - the vans had hardly any space between them and it was right in the middle of a busy parking/shopping/ garage area, and for the pleasure of staying the charge was the equivalent of £18 with 4 free bread rolls in the morning! We opted to forgo the bread rolls and moved a few hundred more metres further down the road to a free parking area that was much more pleasant. Unfortunately, the busy E39 is only about 100 metres away but we're surrounded by greenery and there's a couple more vans here to keep us company. Initially we'd thought that parking overnight like this wasn't allowed in Denmark but John's recent read an Official article that explains how it's ok as long as there are no signs asking you not to, and as long as you don't participate in 'camping behaviour' like getting out awnings, tables, chairs and barbies etc.